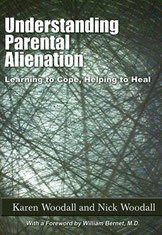 Therapeutic Family Mediation - Nick Woodall - family separation practitioner, writer and parental alienation specialist. I am an ADR Mediator, accredited by School of Psychotherapy & Counselling Psychology, and practicing through the Family Separation Clinic in London. I also sit on the International Committee of the Academy for Professional Family Mediators. One of the most difficult issues that many divorcing or separating parents face is agreeing what parenting patterns will best suit their children whilst, at the same time, providing them with the opportunity to remain as fully involved in their children's lives as possible. Although it is possible to ask the family courts to resolve any disputes that arise, most parents who enter the court process find that it is often a long and expensive one that increases hostility and reduces the potential for the kind of collaborative parenting arrangements that work best for children. Mediation is an affordable, effective and confidential alternative to the court process that empowers parents to make agreements that work best for their families. Rather than having a court impose a solution, parents, themselves, take control of the decision making process with the support of a neutral third party; the mediator. Our reputation at the Family Separation Clinic, as experts in child focussed working, offers you the opportunity to find a solution that avoids the lengthy, expensive and, often, frustrating court process whilst ensuring that you reach agreements that truly benefit your children. Using a Therapeutic Family Mediation (TFM) model, we don't simply work with you to reach a negotiated settlement, we work to assist you in building new and sustainable ways to communicate and resolve conflict, for yourselves, in the future. TFM often looks at wider aspects of the relationship between the parties and how that may have contributed to the dispute. It also explores the past and current circumstances with a particular focus on outcomes for children. We begin the mediation process by working, individually, with each parent to understand their experiences and feelings and to discuss their aspirations, both in relation to settlement of the current dispute and to the longer term parenting relationship. Having assessed, with you, the potential for reaching a settlement we will begin the process of mediation. This will happen either in joint sessions or individually, whichever is the most suitable.